Jacques Fath just launched Fath's Essentials, a collection of four fragrances developed by perfumer Cécile Zarokian, and representing "a sensory voyage through new olfactory territories and rare emotions." New anything is a hard assignment, especially in perfume, and what's a rare emotion? One that's bloody on the inside (fury? sorrow? ), or an emotion experienced once in a blue moon, if we're lucky —something like elation? And how does "new" and "rare" relate to essentials — things like socks, eggs, toothpaste? Let's see! Green Water goes on with delicious-smelling (and vibrant) neroli front and center; it's quickly joined by the scent of fresh/oily citrus peels. Then, Green Water focuses on orange blossom (tinged with almost-not-there cumin for a hint of dirtiness). Today's Green Water smells good, if not as complex as versions past. I've been using the new Green Water as I do Guerlain Eau de Cologne Impériale, as a refreshing post-shower shot of cologne that will fade quickly (especially welcome right before bedtime). Don't expect Green Water to take you through an hour, let alone a day, of wear. A strange accord opens Vers le Sud: mentholated fig milk (but thankfully, this mixture does not "curdle" as you'd expect). Up close, this mix (on the verge of seeming like a "mistake") smells of raw lavender leaf essence combined with crushed lemons and lots of salt; as you pull back, a sweet-milky fig leaf aroma becomes apparent. Vers le Sud has a seaside vibe I can abide and it almost conjures the aroma of sea spray on a warm day. When I first smelled this perfume I was turned off, but as I wore it over the course of a few days I'd find myself smiling as I noticed it. On one afternoon as I wore Vers le Sud, I took a four-mile walk on my lunch break: a mistake on many levels (it was 85 degrees for one thing) but Vers le Sud kept me company and almost made me feel "cool" as I trudged up a Seattle hill or two or found myself surrounded by concrete and glass...with no place to hide. Bel Ambre goes on with liquor-y spice and citrus aromas (you'll really smell the juniper berries and pepper). A classic amber scent emerges as the spices soften but it's augmented with a dollop of iris here, some leather there and a musky ambergris-like undertow. Though all this sounds heavy, it's not; you could wear Bel Ambre in the summertime. Curaçao Bay, at first, smells like a barbershop, with talc-y citrus and green notes, slightly vanillic. First impression: "Oh, no! A sports cologne!" Though Curaçao Bay is my least favorite of the Fath's Essentials collection, I still have a soft spot for it. It's like an annoying work acquaintance who always catches you blowing your nose or with your zipper down, who asks EACH AND EVERY FRIDAY: 'So...what exciting plans do you have for the weekend?' before telling you ALL about their plans. These folks are mostly predictable but will occasionally catch you off guard with a witty comment or kindness, like picking out your favorite pastry from the breakfast cart and bringing it to your office. Curaçao Bay is predictable but unexpectedly fun at times (the sporadically discernible tropical flowers and black currant in Curaçao Bay are the good parts of a mostly expected wearing experience). Fath's Essentials are well-made "staple" fragrances, nothing new or rare here, but if you love one (or two) the pricing is right. Once, I had on all four fragrances and took a shower. 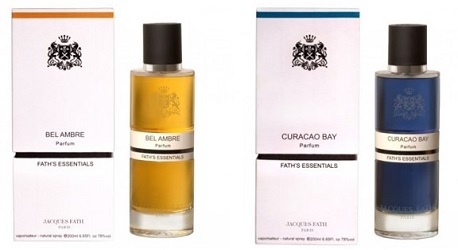 Vers le Sud, Bel Ambre and Curaçao Bay all smelled identical after contact with soap and water: their long-lasting bases are full of faux woods (Cashmeran galore). 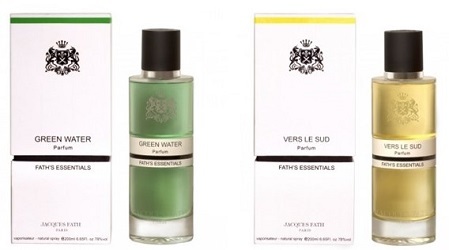 Jacques Fath Fath's Essentials Eaux de Toilette are available in 50 ml (€85) and 200 ml ($215 / €180); they are currently available at Barneys in the US or First-in-Fragrance in Germany. The name and the color of juice for Green Water does not match the description of notes to me…somehow I see the color orange!!! but it sounds like a good fragrance! You really had me laughing with the Curacao Bay analogy…..I have been curious about this line…great review! Cm, you’re right…Green Water does not smell ‘green’ anymore! Hah, I love your dissection of the PR promises. Maybe “new” is a stretch, but these do sound rather different from run-of-the-mill masculines. Good to know, Kevin, thanks! I want a coffret of these 4 fragrances in a travel spray size. Cecile Zarokian was at the most recent Sniffapalooza and the Puredistance event that introduced her as the perfumer for the perfume that Puredistance is launching this Fall. She is tall and gorgeous and really should be the PR model for the perfumes she created. Wait, did Puredistance have samples of the perfume, or was the event basically based on CZ? Oh, and their existing wonderful perfumes. Hah, I wonder if Luca Turin has met CZ in person. There was a bottle of Sheiduna which we were able to try but no samples of it to take home. It’s a warm and spicy oriental, too strong for me but may work well for others. All the other perfumes in the line were there for spritz in and we all got to bring home a full sample set of the 6 perfumes currently in production. The event was pretty intimate in my opinion, with maybe around 25 people, passed hors d’oeuvre and open bar. The event was centered around introducing Sheiduna and CZ. I would be surprised if LT had not met CZ. You really couldn’t miss her even in a crowded room – she is very tall and stunningly good looking. I won a sample coffret of all 4 perfumes from a perfume blog way back in February; but I still have yet to receive them, and somehow after waiting 3 months, I don’t think I ever will, so I will have to hunt down the samples myself. Although it is not a travel spray size, I did notice that the Perfumed Court is offering a manufacturers coffret of all 4 samples (not decants) from the line if you are interested. Good to see your take on Fath’s Essentials. I enjoyed going through them all, for me Curacao Bay was also the least interesting but on the whole I pretty much enjoy this collection. Cecile introduced me to them all as we had a lovely conversation in Milan.